CS463 is the next generation of intelligent fixed readers from CSL. Offering an event engine with multiple layer nested logic for full embedded business automation. The CS463 offers an edge server to allow easy HTTP access for configuration, status monitoring, and direct RFID inventory. Offering Cloud server connectivity for fully synchronized ubiquitous operation anywhere, and allowing remote installation and configuration (demonstration purpose only, user can use sample source codes to port to their own Cloud). CS463 has a rich API compatibility portfolio, including the CSL HTTP/XML protocol with full event engine management, CSL Unified Protocol, LLRP Protocol, and MACH1 protocol. The CS463 reader connects to sensors and peripherals via its optically isolated GPIO, USB and serial connections. The event engine* inside CS463 integrates all these sensors and RFID inventory operationseamlessly to attain sensor fusion so that business processes can be further programmed inside the CS463 to make decisions and then in turn effect external peripherals, such as activating stack lights, gate barriers, etc. 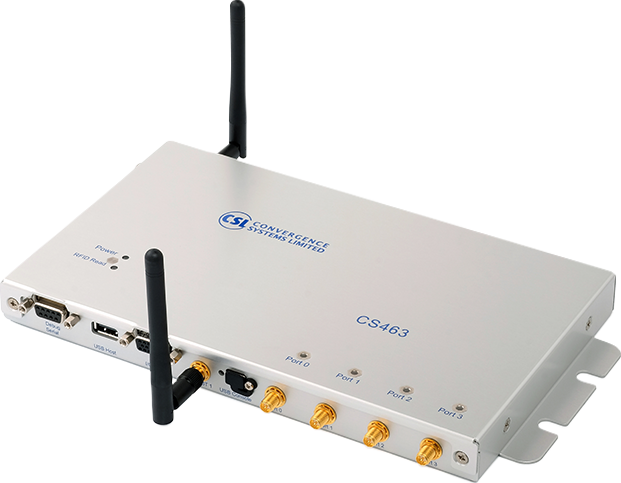 CS463 comes with Ethernet, Wi-Fi, and Bluetooth connectivity making it the easiest connectible reader in the market. CS463 has a fully open Linux OS for ease of application development. Built in Event Engine for Intelligent Automation and IoT integration. 4 RP Female SMA Antenna Ports. Long read range of 19 meters - tag, reader antenna and environment dependant. Dense Reader Mode (DRM) available. Ethernet connectivity with PoE+ (IEEE802.3at). Note: Will only work with PoE "at". TLS security with digital certificate using AES256 encryption. N=2 RW: for 902-928 MHz, Rest of the World that are subset of this band: e.g. Philippine, Brazil, Peru, Uruguay, Singapore, Thailand, etc. N=7: 920-925 MHz, China, Malaysia, etc.